Get 50% off the Portfolio album, any design, any size, with free worldwide shipping. Use discount code SAdesign to receive free printing on a single album. Includes up to 25 spreads/50 sides, pigment printing on museum quality matte paper. Superior Quality Handmade Photo Albums for Professionals! Don’t miss the chance to have them in half price on Black Friday! Use code: SMARTALBUM2017 and enjoy 30% off all our album products. Great discount for the Cameraclub members, $100 off! Use the code BF17SA at checkout to receive 50% off your entire order. Take 20% off across the entire DreamInBook product line! Use code SMART17 and get 60% off regular price Finao ONE series albums, including the new Boho when you order a studio sample. Get 25% off on all our American series! Use code SMARTBF17 to get 35% off the most beautiful album. Bella Art Albums are handcrafted using a 1/4" thick moisture resistant, acid-free, warp-free boards. Get €25 off. Complete the trade application on our website to get a special Black Friday voucher. Use code 30PIXELLU17R to get 30% off no-correction prints! With six paper types, a variety of border styles, and sizes up to 30x60, there's something for everyone on your list. Use code SA2017 to save 10% on albums. Use coupon code SMART at checkout to save 20% on all Coffee Table and Soft Cover Photo Books. Use code SmartAlbums17 to get 15% off orders of $240 or more site wide. 50% Studio Samples. 50% off Signature Clutches. Use the code PIXELLU to get €15 off Online Stream Tickets for Way Up North 2.0, happening February 19-20th in Stockholm. Online Stream viewers can watch the presentations live as they are happening, or to accommodate various timezones, have up to one week afterwards to view. The event will all be live, with no pre-recorded content. Receive a $50 off voucher on Handmade Albums, Photobooks, Matted Prints and Frames confirmed by January 31st. The promo can be combined with Concept1 promo to get a free duplicate album too! Essence Album free upgrades, cover upgrade to black leather, feee name embossing on the cover! Save 20% or more on all Alien Skin creative editing apps, including Exposure X3. Enjoy up to 20% off premium quality photo books and gifts using code BEMERRY. Take 10% off on the entire line of Wall Displays. This includes our most popular products like MetalPrints, Canvas Prints, Acrylic Prints, Maple Wood Prints, Xpozer, and more! Easily turn your images into beautiful presentations that are sure to impress. Save 25% off Photo books this cyber weekend with the code CYBOOK25. Any yearly storage plan purchase automatically will have a second year included for free! 50% off all of our workflow tools! Save time and energy editing your images in Lightroom Classic, and you'll be back behind the lens in no time at all. This is the last presets bundle you'll ever need. It includes over 1,100 presets in over 30 different theme packs. And during Black Friday and Cyber Monday, you can get it at 50% off! Use code THANKS20 to get 20% off packaging & albums. Use code THANKS30 to get 30% off sample albums! Enjoy 40% off DVLOP intelligent Lightroom and ACR presets. Get 20% off client albums; 40% off sample albums! Save up to $100 on your site! Flothemes are premium WordPress themes for photographers! Enjoy a beautiful, responsive layout, extensive flexibility to design & customize each page, as well as maximum control over your SEO. Get 50% discount on all studio albums! Use code BLACKFRIDAY to get a new website and we'll waive your entire $99 signup fee. Use code BlackFriday2017 to save 10%. Use code BF40 to get 40% off. Join 1.3 million people creating beautiful image galleries with NextGEN Gallery, the most popular gallery system ever for WordPress. Add stunning display styles, social sharing, print sales, digital downloads, proofing galleries, and more with NextGEN Plus & NextGEN Pro. Get €50 off the Islanders Conference Ticket happening in Ireland in March 2018! Plus, get a €50 voucher for food and drinks at our awesome venue! Get 15% off cart for the first 12 hours, 10% off for the rest of the sale. Use code SAVESMART to save 50% on our pricing forms and online classes! Register on our website from Nov 24-27th and get a promo code for 50% off on all Photo Albums and other photo products. You will be able to use it within 3 months from the date of registration. Use code thanks for $100 off our studio annual plan. This offer includes unlimited registries, events, and products. Get 40% off a 12 month membership to PhotoBizX. A photography business workshop delivered into your ears every week. Hear the real facts on exactly how successful photographers are doing what they do. Get the inside info on pricing, marketing, advertising and use what's working right now in your own business. Get 80$ off the proven, repeatable and guaranteed way to generate photography leads, bookings and sales using Facebook Ads. Use code BLACK18 to get 30% off on Standard Books, Fineart Books, and Matted Books. Use code SMBF to get 25% off and free shipping to U.S on any order. Save 50% on all photography business guides. Get the Business Planning Cookbook, SEO Cookbook or Perfect Facebook Ads for $49 each (Reg $99). Get 3 free months of the Advanced Plan at Pic-Time, the ultimate store experience for online galleries, with exclusive marketing tools. See for yourself why we are the best workspace for photographers, from online galleries to printed goods. Save 25% on your PQ Album Sample + receive a FREE cover and paper swatch book (normally $49.00). Use code CORGI to get 50% off any educational video. Our videos focus on various topics of running a successful pet photography business, such as real-life photo shoots, products we offer, IPS meetings, mini-sessions and more! This sale ends at midnight on Cyber Monday, or when all 50 codes have been used - whichever comes first! All new customers who sign-up with the link will receive coupons worth €20, additionally to the free trial! Get 20% discount on our entire range of products. Use code QDAY20 to get 20% off your order. Beautiful photography, beautifully printed, beautifully presented — that's what you and your clients deserve. If you're into portrait, boudoir or pet photography our Studio Boxes are a must. Use code HAPPYTURKEY to get $50 off any Custom Album (1 per studio) and 30% off all Stock Albums. Use code BF17 to save 35% on the entire photography store of Lightroom presets, online courses and eBooks. Get caught up on your editing with ShootDotEdit's Limited Time Only Rollover Pro Plan! With this plan, submit 24 Weddings (Color Corrected & Stylized) per year for $199/month. Sign up and receive 2 FREE weddings immediately! 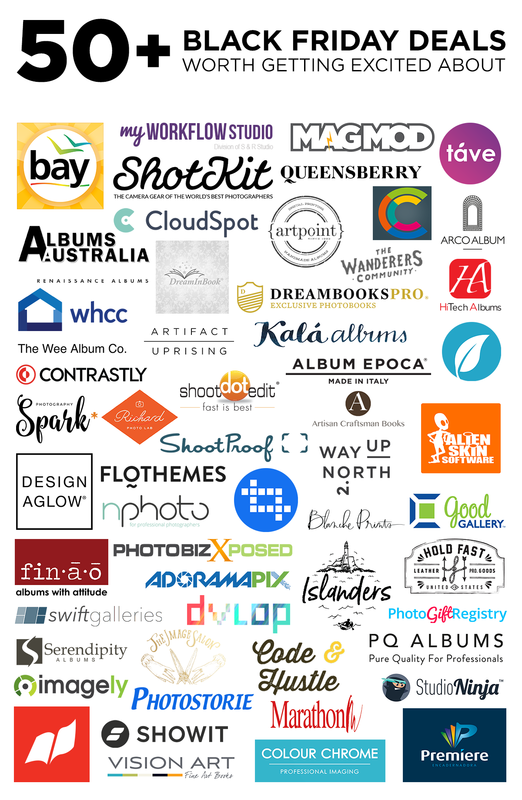 ShootProof offers gorgeous galleries, contracts & invoices, integrated print labs, and MORE - all with no commission fees! New customers save 40% on yearly plans and existing users get 40% off plan upgrades. 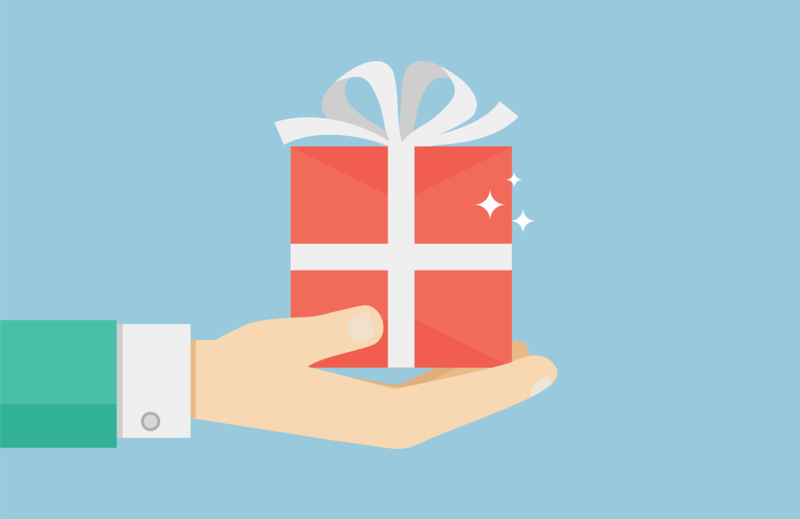 Plus, receive a FREE studio success bundle packed with templates, how-to-guides, and more. Get 30% off any Shotkit book. Save 30% on over 130 premium Showit website templates designed for professional photographers. Every design is mobile responsive, blog ready and completely customizable. Whether you're looking for a design that's modern, elegant, or editorial, you're sure to find a professionally designed website to help grow your business. Get 30% off all Sprout Studio annual subscriptions. Use code BLACKFRIDAY17 to get 50% off! Studio Ninja is an all-in-one photography business software that manages your shoots, invoices, contracts, questionnaires, workflows and lots more! Save $456 on everything you need to get great clients and sell more prints in 2018! Save up to 60% off when you prepay for an annual license. 1, 2, 5, and 10 year plans available. Get 20% off on all orders! Time to clear that editing backlog. Use code BLACKFRIDAY to get 25% off all videos. Free Foil on all Press Printed Cards! Order now through November 27 and your clients get the very best holiday cards, you get all your cards ordered before December, and you save money.